The Tonquin Inn offers 137 suites and rooms including a number with fully equipped kitchenettes as well as luxury units. It is located close to downtown Jasper, a short stroll to all the historic locations of the town, like the town center's Parks Tourist Bureau building, or the old CN Railway Station. With 15 different types of recently renovated rooms and suites, the Tonquin Inn will definitely have something to suit your needs. This Jasper hotel is wheelchair and handicap accessible, not to mention pet friendly too! Most room types feature a convenient kitchenette, and all include internet and wifi access. 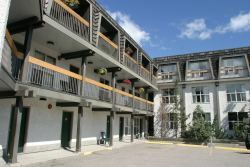 Contact us for more information or to include this hotel as part of your Jasper Ski Holiday package.